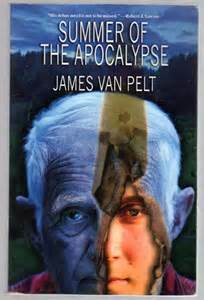 Summer of the Apocalypse by James Van Pelt. 255 pages. Fairwood Press. I have said for a long time that vampire stories aren’t about vampires, that zombie stories aren’t really about zombies. The same goes for stories about the end of the world. Call them apocalyptic tales, dystopia or whatever, they aren’t about disease, nuclear war or any of the other ways that mankind can kill itself off. They are about mankind itself. The nature of humanity. Put another way, stories of this ilk use something horrible to talk about the opposite. Vampire stories, I believe, are about the soul and mortality. Zombie stories are about life and what is essentially significant. And dystopian stories are a microcosm of civilization and its good and bad parts. Summer of the Apocalypse stands head and shoulders above pretty much any dystopian story I have read, including my own Infinity’s Reach, simply because it is personal. It’s the story of one man, spanning actually two stories. One takes place when Eric, the main character, is 75 and is one of the last survivors of the disease that destroyed 99 percent of humanity 60 years before. The second story tells of his survival of the plague when he was 15. Each chapter shifts back and forth between the two stories, which might seem confusing, but actually are essential to each other, and are surprisingly well interwoven. The story when he is 75 centers around his life with his son and grandsons. His son Troy has become leader of their small band of people, and is opposed to the emphasis his father puts on reading and the value of books. With seemingly endless supplies around them, the survivors have gotten used to scavenging to get whatever they needed. But Eric realizes and unsuccessfully tries to convince them that eventually they will need to learn to make, grow and fix things on their own. Frustrated and worried about the future of man, Eric decides to hike from Littleton, Colorado to Boulder and the large university and library there. His hope is that the books there would have the answer to mankind’s problems. The book is surprising in its ability to balance the importance of knowledge with the dangers that come with it. And even though you would think that the author would be promoting the value of reading books, the ending is quite surprising. But more importantly, the story is about how a man–both at age 15 and at age 75–is affected by the changing world around him on a very personal level. His goal in the younger years is simply finding his father, and in the later years is perhaps finding himself, or rediscovering the value of the Old World that no longer exists. As I said earlier, it’s not your typical dystopian treatise. This is literature on a very entertaining, and thoughtful, level. Without reservation, I give this one five out of five stars.